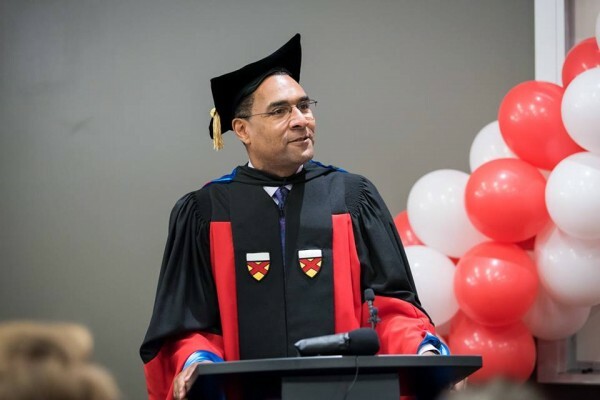 Editor’s note: On June 17, 2018, President Decatur addressed new graduates of Stanford University’s chemistry department, from which he received his doctorate in biophysical chemistry in 1995. The following are excerpts from his address. What drew me to chemistry was a mode of thinking: rigorous, quantitative observation; the construction and application of powerful models to explain observations; the formation of arguments and conclusions based firmly in evidence as opposed to conjecture; and creative inspiration to ask new questions, or reframe old questions. This last example is maybe the component of thinking that excited me the most, and it still guides and informs much of my regular thinking and work: because it is not just individual, small questions that one ponders or reworks, but rather full chains of inquiry that connect large, fundamental and at times socially impactful dilemmas (such as, how do we address neurodegenerative diseases?) to specific questions that can be probed and tested by rigorous experimental or theoretical methods (what are the roles of specific mutations in the tau protein that impact protein aggregation?). In other words, good questions fuel good thinking, and breakthroughs occur when one can see that the solutions to one set of problems provide a pathway to understanding a new and larger set of questions. Increasingly the “liberal arts” are put in opposition to studies in “STEM” — science, technology, engineering and mathematics. “Liberal arts” is sometimes used as a shorthand for “the humanities,” leaving the sciences out of the picture completely. In fact, when I became president of Kenyon — a school with a strong tradition in the liberal arts — I heard some puzzled comments from some friends on how and why a chemist would be chosen to lead an institution with a storied tradition in the liberal arts. But there is no opposition between the STEM fields and the liberal arts, only complementarity. … Math and the natural sciences are original liberal arts disciplines. The false equation of “liberal arts” with the “humanities” does a great disservice; a liberal arts education is incomplete without a rigorous education in the sciences, and an education in the sciences is greatly enriched by a broader context of the humanities and arts. The key piece is that the purpose of the learning is to generate effective citizens in a democracy, and that study of these areas leads to the ability to write and communicate clearly, to engage productively in civic and commercial discourse, to take on roles of leadership in society, and to be recognized as an educated person. An education in scientific thinking is essential for this aim. I would like to return to the story of Carl Djerassi ’43. Not only is he another link between Kenyon and the Stanford chemistry department, his trajectory is a reminder of the importance of the liberal arts and access to educational opportunity. Young Carl came to the United States as a teen, a refugee from the war in Europe. Raised in Vienna, schooled in Europe, he and his mother found themselves in New York, separated from other family and friends, without work. Carl talked himself into a junior college — he had never completed high school — then transferred to Tarkio College in Missouri (with scholarship funds identified for him by Eleanor Roosevelt), and then transferred to Kenyon in order to pursue his interest in studying chemistry. At Kenyon, he found the challenging science education that he had been seeking, including opportunities to work closely with faculty members. I had the opportunity to meet with Carl right before a recurrence of the cancer that would eventually take his life. When I asked him about the most memorable parts of his Kenyon experience, he described the community in which he lived: He formed close bonds with a group of students interested in literature and poetry, eventually living in the “writer’s house” on campus. Through these interactions with students and faculty, he further developed an interest in poetry, literature and art, interests that would not only become lifelong passions but a late-in-life career. He took a great deal of pride that, as a scientist, he was able to connect smoothly with the English students on campus, and this experience remained important to him. We are at a cultural moment when the value of education, especially liberal arts education, is being questioned; where access and opportunity for education is being denied to talented young people, whether immigrants, refugees, members of underrepresented groups or students who lack the financial resources to attend college; when the value of both evidence-based scientific thinking and the beauty of poetry are being questioned. As the Djerassi story reminds us, we have an obligation to create opportunity for talented, deserving students, and advocate for the greater value of liberal education.